The 1920s started off on a great note for Fort Wayne sports fans when the Summit City's Bill Wambsganss pulled off an unassisted triple play during the 1920 World Series for the Cleveland Indians. In the fifth game of the series against the Brooklyn Dodgers, Wambsganss caught a line drive with runners on first and second. He stepped on second base and then tagged the runner coming from first. It is still the only unassisted triple play in World Series history. Wambsganss retired as a player in 1926, and he eventually became the manager of the minor league's Fort Wayne Chiefs of the Central League, and the Fort Wayne Daisies in the All-American Girls Professional Baseball League in 1945. During his big-league career, he hit .259 in 1,491 games. Also during the 1920s on the local baseball front, the Lincoln Lifers, a semiprofessional team sponsored by Lincoln National Life Insurance Co., played several major-league teams in exhibition games in Fort Wayne. Such teams as Connie Mack's Philadelphia Athletics, the New York Giants and the Philadelphia Nationals all came to the Summit City in 1920. The Giants beat the Lifers 3-1, despite 10 strikeouts by Fort Wayne pitcher Pete Diederich, who held New York to only one extra-base hit. The Nationals beat the Lifers 13-4 behind Fort Wayne's Ralph Miller, who had four hits. 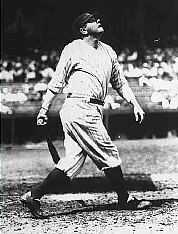 Future New York Yankees manager Casey Stengel played center field in that game for the Nationals. The Lifers lost 5-1 in 1921 to the Cincinnati Reds, who had former Fort Wayne player Bubbles Hargrove on their roster. The Lifers also lost to the Philadelphia Phillies in 1922, with a score of 14-6. The Phillies had another local player, Walter "Butch" Henline. Before they disbanded in 1929, the Lifers played the New York Giants in Fort Wayne in 1926, losing to John McGraw's club 5-3. Perhaps Fort Wayne's greatest moment with major-league baseball came on May 6, 1927, when Babe Ruth and the New York Yankees played here against the Lincoln Lifers. That was the year Ruth hit 60 home runs, and more than 3,000 fans showed up to watch the exhibition game. The game was tied 3-3 in the 10th inning when Ruth stepped to the plate for the fifth time. With two strikes, Ruth belted the third pitch over the right field wall for a two-run home run that gave the Yankees a 5-3 win. As Ruth crossed home plate, he was mobbed by fans and members of both teams. After that season was completed, with the Yankees winning another World Series title, Ruth returned to Fort Wayne with a barnstorming team. He hit a home run to left center that landed in a freight car of a passing train. Ruth later claimed this was the longest home run he ever hit, a truly "Ruthian" tale. Fort Wayne re-entered the minor-league baseball business in 1928 with the Chiefs, who rejoined the Central League. Among their best players was future major-leaguer Chuck Klein, who later became a top hitter for the Philadelphia Phillies. In 1929 the team became a farm club for the St. Louis Cardinals for one season. Fort Wayne's first Olympic athlete took part in the 1924 Paris Olympics. High-jumper Bob Juday was a Geneva High School graduate who lived and worked in Fort Wayne. He did not place in the Olympics, but in 1925 he beat American record-holder Harold Osborn during a meet in Chicago. Also during this decade, the first men's city golf tournament was held in 1926, and the Fort Wayne Sports Club was formed in 1927. Sources: "Batter Up! Fort Wayne's Baseball History" by Robert Parker, The Old Fort News, 1967. "Opening day. . . It happens every spring and it all started in Fort Wayne on May 4, 1871" by Robert Parker, The Old Fort News, Winter 1971. "Fort Wayne Sports Yesterday and Today" by Michael Hawfield, 1994. "Twentieth-Century History of Fort Wayne" by John Ankenbruck, 1976.